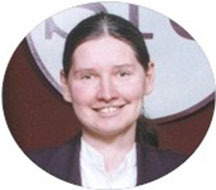 Dr. Harackiewicz's research interests are in: (a) Electromagnetics, (b) antenna theory and design, (c) microwaves, (d) microstrip phased arrays and anisotropic materials, (e) small multiband and broadband antennas, (f) PIFAs, (g) loops, (h) printed and dielectric antennas. Ph.D., Electrical Engineering, University of Massachusetts Amherst, February 1990. M.S.E.E., University of Massachusetts Amherst, May 1986. B.S.E.E., University of Massachusetts Amherst, May 1984. Inventors: Peter J. Rainville and Frances J. Harackiewicz, Patch Antenna with Magnetically Controllable Radiation Polarization, U.S. Patent No. 5,502,451, issued: March 26, 1996. F. J. Harackiewicz and D. M. Pozar, "Optimum shape synthesis of maximum gain omnidirectional antennas," IEEE Transactions on Antennas and Propagation, vol. AP-34, no. 2, pp. 254-258, Feb. 1986. H. How, P. J. Rainville, F. J. Harackiewicz, and C. Vittoria, "Radiation frequencies of ferrite patch antennas," Electronics Letters, vol. 28, no. 15, pp. 1405-1406, July 1992. P. J. Rainville and F. J. Harackiewicz, "Magnetic tuning of a microstrip patch antenna fabricated on a ferrite film," IEEE Microwave and Guided Wave Letters, vol. 2, no. 12, pp. 483-485, Dec. 1992. H. How, P. J. Rainville, F. J. Harackiewicz, and C. Vittoria, "Radiation frequencies for magnetically nonsaturated ferrite patch antennas," Journal of Applied Physics, vol. 73, no. 10, pt. 2B, p. 6469, May 1993. B. Lee and F. J. Harackiewicz, "RCS of a microstrip antenna on an in-plane biased ferrite substrate,"IEEE Transactions on Antennas and Propagation, vol. 44, no. 2, pp. 208-211, Feb. 1996. E. Rozan, C. Collado, A. Garcia, J. M. O'Callaghan, R. Pous, L. Fabrega, J. Rius, R. Rubi, J. Fontcuberta, and F. J.Harackiewicz, "Design and fabrication of coplanar YBCO structures on lithium niobate substrates," IEEE Transactions on Applied Superconductivity, vol. 9, no. 2, pt. 3, pp. 2866-2869, June 1999. B. Lee, F. J. Harackiewicz, J. Lee, J. Kim, and N. Kim, "Measured equation of invariance based on wavelet transform technique," Microwave and Optical Technology Letters, vol. 33, no. 1, pp. 47-49, April 2002. B. Lee and F. J. Harackiewicz, "Miniature microstrip antenna with a partially filled high-permittivity substrate," IEEE Transactions on Antennas and Propagation, vol. 50, no. 8, pp. 1160-1162, Aug. 2002. B. Lee and F. J. Harackiewicz, Gi-Cho Kang, Uiseok Hong, Jong-Chui Lee, and Bok-Ki Kim, "Enhanced Impedance Bandwidth of Microstrip Antennas Using Coupling," Microwave and Optical Technology Letters, vol. 39, no. 2, pp. 79-81, Oct. 20. 2003. Lee, Byungje; Harackiewicz, Frances J.; Kong, Ki-Hyun; Byun, Joonho; Yang, Sung-Hyun, “Dual-band dual-circularly-polarized sector antenna for GPS and DAB systems,” Microwave and Optical Technology Letters, v 46, n 1, Jul 5, 2005, p 43-46. Harackiewicz, Frances J., Jung, Byungwoon, Lee, Byungje, “GPS/PCS dual-band internal antenna with parasitic element,”Microwave and Optical Technology Letters, v 46, n 3, Aug 5, 2005, p 297-301. B. Lee, F. Harackiewicz, B. Jung, and M-J Park, “Cavity-Backed Slot Antenna Array for the Repeater system of a Satellite Digital Multimedia Broadcasting Service,” IEEE Antennas and Wireless Propagation Letters, vol. 4, December 2005, pp. 389-392. Byung-kil Yu, Byungwoon Jung, Ho-Jun Lee, Frances J. Harackiewicz, and Byungje Lee, “A folded and bent internal loop antenna for GSM/DCS/PCS operation of mobile handset applications,” Microwave and Optical Technology Letters, vol. 48, no. 3. March 2006. H. Rhyu, S. Heo, Y-S Chung, F.J. Harackiewicz and B Lee, “Electrical loop antenna using stacked patches for 433.92 MHz RFID reader,” Electronics Letters, 25th May 2006, v. 42, n. 11, pp 611-612. Byungwoon Jung, Hanphil Rhyu, Young-Joong Lee, Frances J. Harackiewicz, Myun-Joo Park, and Byungje Lee, “Internal folded loop antenna with tuning notches for GSM/GPS/DCS/PCS mobile handset applications,” MOTL, v 48, n 8, August 2006, pp 1501-1504. Byungwoon Jung,Hoo Shin, Frances J. Harackiewicz, Myun-Joo Park, and Byungje Lee, “Multiband antenna using a half-wavelength loaded line structure for mobile handheld systems,” MOTL, v 48, n 9, September 2006, pp. 1683-1687. B. Jung, J-S Lee, M-J Park, Y-S Chung, FJ Harackiewicz and B Lee, “TDMB/AMPS/GSM/DCS/PCS/SDMB internal antenna using parasitic element with switching circuit,”Electronics Letters, v 42, n 13, Jul 22, 2006, p 734-736. Sung-Joo Kim, Byunggil Yu, Young-Seek Chung, Frances J Harackiewicz and Byungje Lee, “Patch-type radio frequency identification tag antenna mountable on metallic platforms,” MOTL, v 48, n 12, December 2006, pp 2446-2448. Rhyu, Hanphil, Jo, Jae-Hoon; Harackiewicz, Frances J.; Lee, Byungje, “Multiband internal antenna using two layer shorted patches for mobile handsets,” Microwave and Optical Technology Letters, v 49, n 1, January, 2007, p 176-179. Yu, Byunggil, Kim, Sung-Joo; Jung, Byungwoon; Harackiewicz, Frances J.; Lee, Byungje, “RFID TAG antenna using two-shorted microstrip patches mountable on metallic objects,” Microwave and Optical Technology Letters, v 49, n 2, February, 2007, p 414-416. B. Lee, C. Jung, B. Yu, K. Kong, N. Choi, F.J. Harackiewicz, I. Lee, S. Cho, M.-J. Park, and Y.-S. Chung , “Design concept of compact antenna for SDARS applications,” Electronics Letters, 2 August 2007, Volume 43, Issue 16, p. 845-846. Rhyu, Hanphil, Harackiewicz, Frances J.; Lee, Byungje, “Wide coverage area of UHF-band rfid system using a pattern reconfigurable antenna,” Microwave and Optical Technology Letters, v 49, n 9, September, 2007, p 2154-2157.